If it’s time to purchase new gutters for your home in Des Moines, Iowa, or another nearby area, turn to the gutter experts at Waddle Exteriors. Our factory- and manufacturer-trained employees will ensure that your new gutter system is installed perfectly, and to further support the premium quality of our work we offer a 100 percent satisfaction guarantee on all of the gutters that we install. Seamless – We will custom-cut your new gutters to the exact dimensions of your roofline, so they’re won’t be any seams holding your gutter system together. Installed with hidden hangers – Our hidden hanger system helps to make your gutters a more natural and visually-appealing part of your home. Available in several different colors – Since we can cut gutters from many different kinds of metal, you’ll be able to choose one that matches your home’s aesthetic. To help keep your new gutters clean, Waddle Exteriors offers Gutter Topper, which is the No. 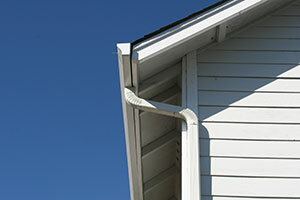 1 consumer-rated gutter protection system on the market. Gutter Topper has a rounded nose design, which uses surface tension to channel water into your gutters, while preventing leaves and other potentially obstructive materials from causing a blockage. If you’re looking for new gutters, contact Waddle Exteriors today for expert installations and superior products. We proudly serve residents of Des Moines, IA, and other nearby areas.